Egg nog is terrible for you. Everyone knows it. 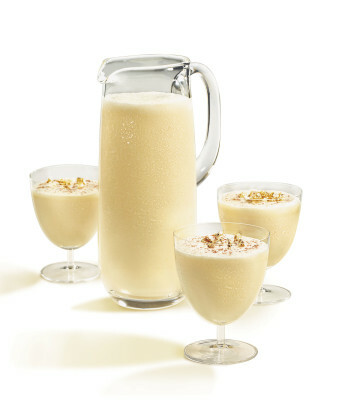 They try to help by making "low fat" egg nog, but it tastes like nothing more than holiday horchata. So in an effort to stay mildly healthy, instead of drinking a large portion of nog for dessert, when its saturated fat will bloat in my stomach overnight, I take it in little portions: a little in my coffee, maybe a sip after lunch or mixed with milk later. It's a bit healthier and spreads the delight throughout the day. And that's when the thought hit me -- taking in something as awesome as egg nog in smaller portions is a good way to take in God. We can and should have a set-aside time with God every day (a large cup of egg nog), but inviting Him into our daily lives in little ways throughout the day can be just as rewarding, and maybe even more so (egg nog in the coffee). It's a silly illustration, and God isn't bad for you like egg nog, but the truth is still there. As Brother Lawrence famously said, we can be just as close to God doing the dishes as any other "spiritual" activity (paraphrase). My first full summer in Southern California, a friend told me about a mystical and elusive spot known as Trestles, at least that's how it sounded to me at the time. Somewhere in San Celemente, CA, you had to walk a long path through the bush to get to the rocky, but worthwhile break with amazingly long rides that my informant claimed was where he learned to pump. Sounds good to me! I've been, and it lives up to the legend (minus the mythical and elusive part), so I thought I would provide some tips in case you want to visit this famous surf spot. 1. It's a long hike to the break, so bring a bike or skateboard. In actuality, it's not too terribly long, though it's definitely more than the usual parking lot-to-the-sand walk you might be used to. Plus, you want to save all your energy for the fantastic waves you are about to surf. Bikes, boards, bags. All good for Trestles. 2. Trestles is a rock break, so bring your booties if you have them. On my last visit, my leash came off and, at low tide, it is a LONG walk back over the rocks to retrieve your board. 3. Get there early, as parking fills up quickly. With no official parking lot, Trestles is limited to street parking that sometimes can fill all the way up into the nearby neighborhood. This is another good reason to bring alternate transportation (bike or board). Rocks make for a bad walk, but great surf. 4. The waves are quite good, and so really good surfers frequent the spot, including a lot of pros that come out of San Clemente with Trestles as their home break. Tread lightly if you are not fully confident in your skills, but don't let it deter you. It is a long beach with plenty of space to spread out if you're not up to surfing the biggest or most crowded spots. 5. Bring lunch, because this break is so fun you're going to want to spend all day there. If all day isn't enough, go camping! San Mateo campground is only a bike ride away from the break, though you have to peddle over a gnarly hill to get there. Still, it beats finding parking! The last time I was there, the Hurley Pro was going on, which should let you know how good this break is! My friends and I shot a little footage of the experience, including the campground, which you can see here. Or watch some pro footage below from the same weekend!